Different ornamental fish species, astronot Astronotus ocellatus (n=3), goldfish Carassius au-ratus (n=11), discus Symphsodon discus, (n=3), beta Betta splendens, (n=2), guppy Poecilia reticulata, (n=5), convict cichlid Cichlasoma nigrofasciatum, (n=13), blue streak hap Labi-dochromis caeruleus, (n=8), angelfish Pterophyllum scalare, (n=2), black molly Poecilia sphenops, (n=3) and severum Heros efasciatus, (n=5) were sampled from Turkey between 2009 and 2010. Dactylogyrus sp., Gyrodactylus sp. (Monogenea), Epistylis sp. Chilodonella cyprini, Ichthyophthirius multifiliis, Tetrahymena sp., Trichodina spp., Vorticella sp. (Ciliates), Hexamita sp., Ichthyobodo necator (flagellates) and Piscinoodinium pillulare (Dinoflagellate) were identified from those sampled fish. I. multifiliis, I. necator and Trichodina spp. were ob-served as highest prevalence (16.36%) in all parasites. 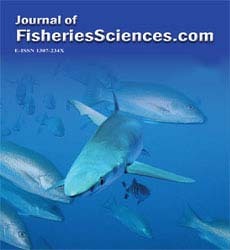 From a total 55 examined fishes, 50 (90.90%) fish were parasitized. Vorticella sp. was reported as a first record from the gills of Cichlasoma nigrofasciatum and also Piscinoodinium pillulare was reported for the first time from Betta splendens in the country.